The cowboy may well be the quintessential American icon. Robb Kendrick has been photographing cowboys for twenty-five years, creating a magnificent artistic record that recalls the work of earlier photographers such as Edward S. Curtis, whose portraits of Native Americans have become classics. Kendrick even uses an early photographic process—tintype—to create one-of-a-kind photographs whose nineteenth-century appearance underscores how little twenty-first-century cowboys' ways of working and types of gear and dress have changed since the first cowboy photographs were made more than a century ago. 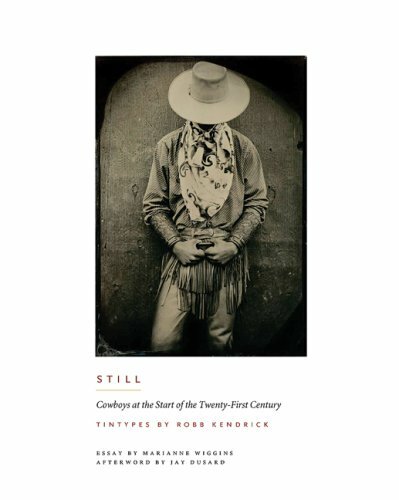 In Still, Robb Kendrick presents an eloquent collection of tintype cowboy photographs taken on ranches across fourteen states of the American West, as well as in British Columbia, Canada, and Coahuila, Mexico. The photographs reveal the rich variety of people who are drawn to the cowboying life—women as well as men; Native Americans, Mexican Americans, and African Americans as well as Anglos. The images also show regional variations in dress and gear, from the 'taco' rolled-brim hats of Texas cowpunchers to the braided rawhide reatas of Oregon buckaroos. Marianne Wiggins, author of a recent novel about Edward S. Curtis, introduces the volume, and Jay Dusard, a photographer renowned for his cowboy images, provides the afterword. Robb Kendrick tells the backstory of the project in his photographer's notes, while also interweaving stories from the cowboys themselves among the images. Both an evocative work of art and a masterful documentary record, Still honors the resilience of modern cowboys as they bring traditional ways of living on the land into the twenty-first century.